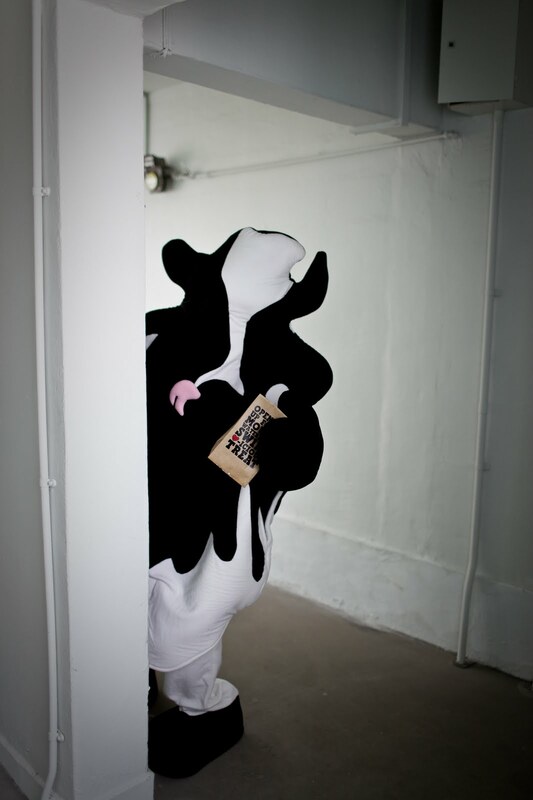 A cow showed up at my office. No, this is not some mean poke at fat Appetite staff. A cow literally showed up. I got a call from reception informing me of a strange guest visitor. 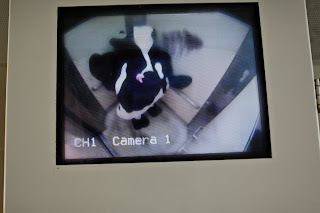 So when I stood up and walked over to see, I immediately freaked out and ran over to my assistant editor's desk to hide (she later showed her loving support by following me over with her camera instead). The gals at Ben & Jerry's had informed me the day before that I would be getting a sample of the new Ben & Jerry's flavour dropped off the next morning. I didn't know the cow himself would show. I twittered like mad that morning...mostly freaking out and stunned by the whole ordeal. 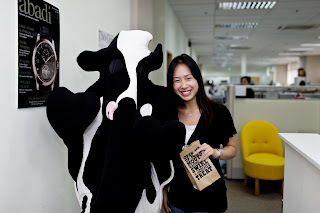 The ENTIRE office came over to see why there was a cow in our office... and wondering why on earth was Woody (the cow) taking photos with me?! This actually happened back in early April, but I never got around to posting about it until now. It certainly made my morning despite being absolutely flabbergasted. I was all smiles the rest of the day. And the new ice-cream flavor? "Clusterfluff." Yeesh, I almost typed that wrong. Slightly inappropriate typo if that happened. It's delicious though. Give it a try.